While it's unlikely the boards embedded into mini-notebook laptops will ever find their way into the general market, the market for these almost toy-like devices will surely grow. SFF-SIG: New logo, new start, and a SUMIT to ascend. 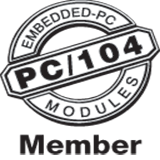 Meanwhile, the PC/104 Consortium rolls out PCIe, and ESC needs a new name. Traveling far? Consider changing buses? While PCI Express may be the obvious bus for NextGen PC/104 and other SFF modules, it seems that StackableUSB may be a more useful one. Only the status quo of network neutrality will mean business as usual; a multi-tiered Internet will affect our market in unknown ways. Increasingly, I’m seeing PC/104 and other Computer-On-Module/System-On-Module (COM/SOM) products geared towards what are certainly not desktop PC applications. Yet, PC/104 and many of the other flavors we cover in PC/104 and Small Form Factors magazine have their origins in the desktop space.